Here’s what’s up in the world of TV for Thursday, May 8. All times are Eastern. Comedy Bang Bang! (IFC, 10:30 p.m.): There are many comings and goings tonight, but we really like both exclamation points and onomatopoeia. 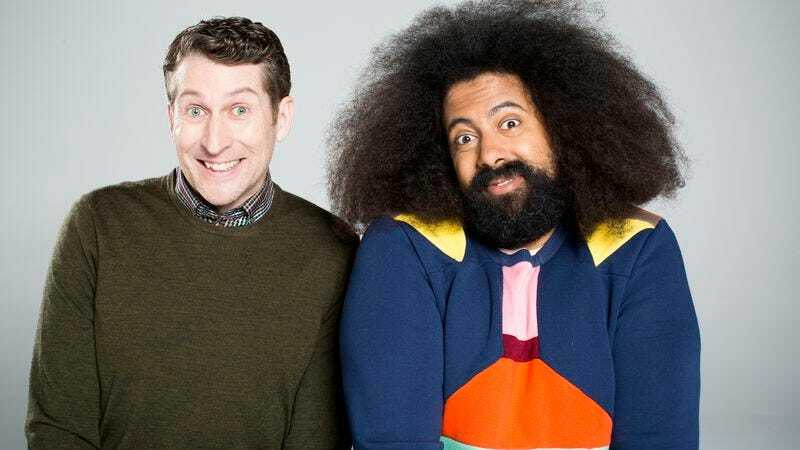 Scott Aukerman and Reggie Watts return for the third season of their variety show, and The A.V. Club is returning to cover it—with a Very Special twist: We’ll have three regular reviewers on the show rotating through coverage. So up tonight is LaToya Ferguson, who will take on Patton Oswalt’s guest-stint on the show; next week it’ll be David Kallison; and finishing out the rotation is Emily L. Stephens. Give them a Bang Bang welcome. Maron (IFC, 10 p.m.): And the other show by a comedian that is titled merely with the comedian’s name returns tonight. We won’t be covering this week-to-week, but Phil Dyess-Nugent took a look at the first four episodes and offered a verdict. He did this for you, readers. For you. KINDA WEIRD THAT ONLY CBS AND ITS SISTER NETWORKS’ SHOWS ARE STILL RUNNING, RIGHT? LIKE MAYBE THAT’S THE ONLY MEDIA COMPANY WHO TAKES THE WHOLE 22-EPISODE RUN THING FROM SEPTEMBER TO MAY QUITE AS SERIOUSLY ANYMORE? Caps lock is hardly the best mode for social commentary, What’s On Tonight! Star Trek: Deep Space 9 (11 a.m.): It’s here, it’s finally here: The last meeting of Zack Handlen’s Fictional Outer Space Space Station Support Group. Today Zack takes on the two-part finale, “What You Leave Behind,” thus ending an epic journey through time, space, and most importantly, our hearts. Also sorry, we forgot the Kleenex. Friday Night Lights (2 p.m.): Keeping hope alive over in Dillon, Texas is Sonia Saraiya, who today looks at Julie Taylor and Matt Saracen’s first date, as well as the epic fallout of Tim and Lyla’s brief, torrid love affair. American Comedy Awards (NBC, 9 p.m.): Nominees include all your faves: Louis C.K., Amy Schumer, Hannibal Buress, and many more. Awards are chosen through some combination of popular vote and industry vote. Surviving Jack (Fox, 9:30 p.m.): Another first-season finale. There might be even less to say here. Two And A Half Men (CBS, 9 p.m.): 11th-season finale. We got nothin. Jerry Maguire (AMC, 8 p.m.): Dude, we were just talking about this movie! Sports, right?? NBA Playoffs (ESPN2, 7 p.m. and 9:30 p.m.): Game two of the semifinals for both conferences: Brooklyn Nets at Miami Heat, and Portland Trail Blazers at San Antonio Spurs. Stanley Cup Playoffs (NBC Sports, 7:30 p.m.): And in game four of the Eastern Conference second-round, the Boston Bruins face the Montreal Canadiens. The Americans: Hoo-boy, hasn’t this season been great? Todd VanDerWerff and Genevieve Koski think so!